Britax Frontier 85 Car Seat Review-Giveaway! I have to admit, I am more than thrilled to be working with Britax. Before I even started my blog, I LOVED Britax. We currently own two convertible Britax carseats that we bought due to the high safety ratings and on the recommendations of the employees of Babies R’US, as well as, friends’ recommendations. I have never been more happy with these car seats. Zane’s Britax convertible car seat is backward facing till he turns 2 and Hayley is enjoying her car seat. While I am in no rush to change her to a booster in my car, I was looking for a seat for her to use in our babysitter’s car for the days that she drives her to school. I needed a booster seat that could be used in harness mode due her age/weight. Thankfully, Britax sent us the Britax Frontier 85 car seat, and I have to say, that Britax did it again with developing an ingenious booster car seat! The Britax Frontier 85 is the highest capacity booster seat on the market today. Britax redesigned the Frontier 85 so it now can hold even greater weights with higher age limits. In the harness mode, children must be two years of age and weigh between 25-85 lbs (11.4-38.6 kg) and stand 30-57 in. (76.2-144.8 cm) in height. To be sure that your child should be in harness mode, their top of their ears must be below the top of the head restraint when seated and the harness straps must be located at or above the child’s shoulder when seated. For the booster mode, the child must be at least 40- 120 lbs (18.2-54.5 kg) and stand 42-65 inc. (106.7-165.1 cm) in height. For the harness mode, the top of the child’s ears must be below the top of the head restraint and the vehicle belt must be appropriately positioned at or above the child’s shoulder through the shoulder belt guide. Britax recommends booster mode only be used after the child outgrows harness mode. It is also recommended through the American Academy of Pediatrics, that the longer the child remains in a booster, the safer they are. When we first received the box, I was nervous because my husband was out of town and I needed to put it together myself- this is a first for me! Of course, we will only be using Hayley in the five point harness mode so I simply read the detailed instructions that Britax included to put it together. It was SO EASY to put together. You can readily install the Frontier 85 via a latch system or with a belt buckle. We have the latch system but if you have the belt system, they have offered two different path options depending on the length of the belt buckle, for easy access and installation. Britax, however recommends only the vehicle’s lap and shoulder belt system when restraining a child in booster mode. They also recommend if you use the long belt path, that you never use with a latch or a lap belt. Prior to doing this, I had Hayley sit in the car seat to make sure all the harness adjustments were made. The Britax Frontier 85 has very similar adjustments to the two Britax convertible car seats we own. To loosen the harness, there is a lever between the area where your child’s legs will be. You simply release the lever and pull the harness straps together. You then lift and slide the harness height adjuster into the desired position, and release. Ensure the adjuster is seated securely between the notches and you are set to go. I did take me one or two times when I first got my convertible car seat to make sure I was doing it correctly. However, after a few times, I became a pro and had zero problems with the Frontier 85. The buckle positioners were very easy to adjust, as well as the chest clips that are on the Frontier 85. These chest clips are the same ones used on the regular convertible Britax car seats. For some reason, when I thought about the booster, I didn’t imagine having the same chest clips that are used in our other cars. I love these chest clips as they are easy for Hayley to close but difficult enough that she can never open the clips without my help. I have seen other car seats where kids have found a way to open up the chest clips- not the way with any of the Britax car seats! In terms of safety, Britax, according to Consumer Safety, rates #1. The Britax Frontier incorporates many safety breakthrough technology including True Side Impact Protection, Versa-Tether, HUGS, and more. Besides being my #1 choice, I also love the extra features that are seen with the Britax Frontier 85. In addition to the comfy and very plush seats, they have added built in cup-holders which are not seen with their other convertible carseats. I love the fact on long rides, she could take a drink with her without the thought of it spilling all over our nice car. Hayley also loves to rest her arms on the arm rests. It makes her feel like a big girl! I give the Britax Frontier 85 an A +. I loved Britax to begin with, but when testing this car seat my love for the company doubled. I know there are cheaper boosters on the market, but truly none that have all the features and safety rating of the Britax Frontier 85. Look no further than Britax for all your booster needs! Buy it: You can the Britax Frontier 85 can be bought at Amazon, Babies R’ Us, Buy Buy Baby, Diapers.com, and many other retails where Britax products are sold. They retail for $299. Win it: One winner will receive their very own Britax Frontier 85. This giveaway is run via rafflecopter so click continue reading to see the actual giveaway. The only mandatory entry is to visit Britax and tell me what your favorite product is, in the comment section proceeding this post. While the other entries are optional, I highly suggest you fill them out to increase your chances of winning. US and Canada. Good Luck! *Thanks to the PR firm representing Britax for supplying me with a Britax Frontier 85 to review. As always, all my opinions are my own and not swayed by outside sources. Teach My Preschooler, Baby, or Toddler Review-Giveaway! Did some big shopping with the Catalog Application this weekend! The Child Cup Holder! There are never enough cup holders in cars & having one handy for your child is an excellent idea! This looks so comfortable! What a wonderful seat! Car Seats! I Love them! I REALLY DON’T HAVE A FAVORITE. I HAVE’NT TRIED ANY OF THEIR PRODUCTS. We have a Britax 70 and LOVE it. I feel safe with this brnad and love the fact our seat was made in North Carolina! This would be so great! My daughter is just about ready to move to a forward facing carseat and this one is perfect! I’ve never tried any Britax products before! Ive never had any of their products but this carseat is amazing! We have a Boulevard and a Marathon. Love them both! I don’t own any britax but I would love to own one of their marathon or frontier carseats! The safety! all 3 of mine are Britax Babies! I simply love everything about the frontier 85. THanks for the chance to win won for my daughter. I’ve never owned any Britax products they have GREAT reviews and I’m in the market for a new carseat. Pick me!!!! I have yet to own any Britax products, but I’ve wanted to. Would love to win!! I have only had their strollers, and they are great! We will need to upgrade our daughter soon and have been doing a lot of research on brands. Britax seems to be the best so far! My favorite is the B-Nimble Stroller. I don’t own any Britax products yet but when I saw this car seat I knew I had to have it. Would love to win it. Thanks. The B-agile double would have been great for my kids (13 months apart) when they were younger. But we don’t use our double stroller that much anymore. We do NEED a new carseat, so thank you so much for this giveaway! We are a Britax only family, for convertible car seats anyway, I bought a Graco infant used from a friend for cheap, and we LOVE our Marathon car seats! We have 2, one for each vehicle. Would sure be handy to win another for baby #2! Love all Britax. Carseats are great! I have never tried this brand but am stoked to do so!!!! I like the Britax B Agile. Don’t have a fave yet cause we’ve never owned or tried a britax. I don’t own one, but I love the reputation for safety that they have! My little one and I LOVE the Britax Marathon! So easy to assemble and install! I love how easy it is to install in the car and I love the Velcro on the harness to keep it in place! We have the chaperone and the B-Ready stroller and love them both, but it wont be more than a few months before we are going to need a car seat like this! I have yet to own a Britax seat, since I have triplets & “buy in bulk” its been out of our price range. But its on my bucket list!! We own the Britax Chaperone carseat, stroller, and Marathon carseats and love them all!! Would love to have a Britax carseat – love the safety ratings! I love our Marathon 70 but for the next stage up when we need to replace his soon to expire 2nd car Roundabout, the Frontier 85 looks great! Thanks for the review. B-AGILE Double- I am have my Second & looking for a double! I would love to win this Car Seat, who WOULDNT?! I think their car seats are wonderful! Britaxis a great brand I love their strollers and the marathon car seat is great. I need a new one and this would be great. The carseat! I could really use a toddler seat for the future! I like the Roundabout 55 seat! We are in need of another good carseat as our 18 month old is outgrowing her Graco one and we’ll need it soon for our new baby! i love their carseats best! I’ve never owned a Britax item, I loved the safetly ratings and I also love the design of the seats. I have the Britax car seat in cowmooflage and I’m in love with it. Britax B-Ready stroller would be my favorite. I love and car seats and strollers. Thanks for the chance. They have great looking strollers, so probably one of those. I love the Britax B-Ready soooooo much! I haven’t gotten to try any of them yet because they’re a little out of my personal price range but I REALLY want to try them because I love the fact they’re #1 rated!! Love their car seats and strollers! I have a B-Ready Stroller with second seat and love it! From Britax, I like their B Agile Stroller and their Baby Carrier. They are definitely tops for car seats – have never been able to afford one when we’ve needed it, but will need another one soon! Haven’t tried any of their products yet! We have a Boulevard and it’s our favorite! I really like the B-AGILE stroller. We have a Boulevard and we love it and Britax! I’m not familiar with their products but I really like the car seat your giving away. I need one for my neice.Thanks for the giveaway. The strollers are my faves. No fave yet! I keep hearing how safe they are. I need a car seat badly!!! Thank you! We have LOVED almost all of them that we’ve purchased! The only thing we didn’t love was the Chaperone STROLLER. But we love their seats! The Frontier 85’s, Advocate 70 CS, and their Chaperone infant seat! Everything I have purchased! From the first Marathon back in 2006 (we currently have 3), the Frontier, and now the Parkway which I ordered last week. My goal is to have all 3 of my girls in Frontiers before the end of the year (I need 2 more). We are a Britax family for sure!! We actually don’t have any Britax products but are in need of our next car seat and would LOVE this! Thank you! I don’t have it, but I really like the B-Agile Stroller! My favorite is the 2012 B-READY Travel System. We have several of the Britax Convertible Marathons and love it! I love the B-Agile Travel System Compatible Strollers! The features are awesome and it’s versatile! I love Britax products! We have the boulevard and roundabout! love their car seats. have an advocate but my son is getting to big for it. i like the bready system! I like the Carseats the best! I love Britax’s car seats! We have a Decathlon right now (retired style) but we’re soon going to outgrow it and will need something with a higher weight limit. I really like the Advocate 70 CS. I like their carseats! especially the Frontier 85! I like that the harness can be used for bigger children. I like the 2012 B-READY Modular Stroller and the Stroller Board. I like their “b-agile double” stroller! I like the b agile. We have a b-nimble stroller and we love it! we have one of their booster’s and i love it for our oldest! I’ve never used britax before, but I’ve heard their carseats are the best! Oh I love the 2012 B-Ready stroller! We have a round about but I would love this booster to move my son into since we are having our 3rd baby! I have never tried any Britax so maybe if I win this will be my new favorite! I have always been a big fan of their strollers. Always nice made and easily used. It’s hard to pick a favorite – they have a TON that I like. We have the Frontier 85 for one of our kids already and really love it; I’d love to have one for the other kid. 🙂 I also love the B-READY stroller! I really like the B-Agile Stroller. I love Britax products my favorite is the Marathon carseat. My daughter loves it. i like the b agile and b safe! I like the bicycle seat but all the products look good. I would have to say the car seat is my favorite. I’ve heard great things about them! I’ve got a Britax booster seat for my son right now (and its easy to use and aparently very comfy), but since its been more than 2 years, we need to get a new car seat for our next one… Thanks! I don’t have any britax, but always thought the strollers looked amazing! I like the Chaperone infant seat and love that it has a quick adjusting, no-rethread harness. Our first child’s carseat had that feature as well, and I am on the hunt for an infant seat for Baby#2 due this summer with the same easily adjustable harness. In all honesty, it’s likely the Frontier. I dont own britax products but would love to try the BAgile stroller. I don’t have on yet but I’m wanting a Frontier and Marathon. They have the best carseats. I’ve yet to try any of their strollers, but I’ve heard great things about the B-Agile and B-Ready! I love the B-agile stroller! I love their Frontier Car seat. We already own one! The Britax booster seat looks amazing. All of their products are my favorite!! Actually, my newest Britax favorite is the window cling. Those are amazing and every pregnant friend of mine will be getting one! I love their B-Ready and B-Agile strollers! Need a booster for my almost 4 year old!!!!! It is time! Never tried, always wanted to! I’ve never tried Britax products before but have heard wonderful things about their car safety seats. I don’t have a favorite since I’ve never used one of their products. I have never owned a Britax product, but I have heard great things about their car seats. I have often considered the Marathon and the Roundabout. Would love to try one! I love the company!! So great! FRONTIER 85 SICT is my fave seat! I love the Britax B- Agile Stroller! The Britax Frontier 85 for my great niece! Thank you sooo much! I like the car seats and strollers! I haven’t used any Britax products, so can’t really have a fave, but I’ve been eying their car seats! I haven’t used their products yet, but the travel systems look awesome. I WANT their B-Agile Double stroller very badly. These are nice strollers. My favorite is the Britax Frontier 85 Car Seat. The B-Agile stroller would be great to have. My favorite products are their car seats as they are very roomy and comfortable. I haven’t tried any Britax products, but their car seats look awesome! I’ve never owned one, but the car seats looks great! they look much sturdier and safer than the car seat I have now. The strollers also look really easy to use. I love their B-Agile Stroller! I haven’t owned a Britax product yet but this car seat would be awesome!!!! Love their car seats, but I’ve had my eye on the Child Bike Seat. OMG Melissa I don’t know how I missed this giveaway. J is so big he’s outgrowing his infant seat, so I would LOVE to give him Stephanie’s Britax convertible and win this booster. WOOHOO. Our favorite has to be the Cowmooflage infant Chaparone carrier. We love the Marathon too, but the Cowmooflage was just like having a beloved designer handbag when you took it around town. Love the Red CHAPERONE Travel System. Just reviewed your lovely site on Alexa as user “Auqakuh”. We don’t have a favourite yet – a few months away still. But the car seat looks fantastic! Their strollers are quite amazing! The B-AGILE stroller is very nice! I like the B-Agile strollers. We’ve been using the Britax Decthalon (sp?) for my oldest and it’s awesome! I would love another Britax car seat for my youngest. I would love the Bike Seat! I had no idea that they made those! I don’t have any Britax products, but a friend has their B Ready stroller and it’s amazing. I’d love to have one of those! The convertible car seats — great safety ratings! 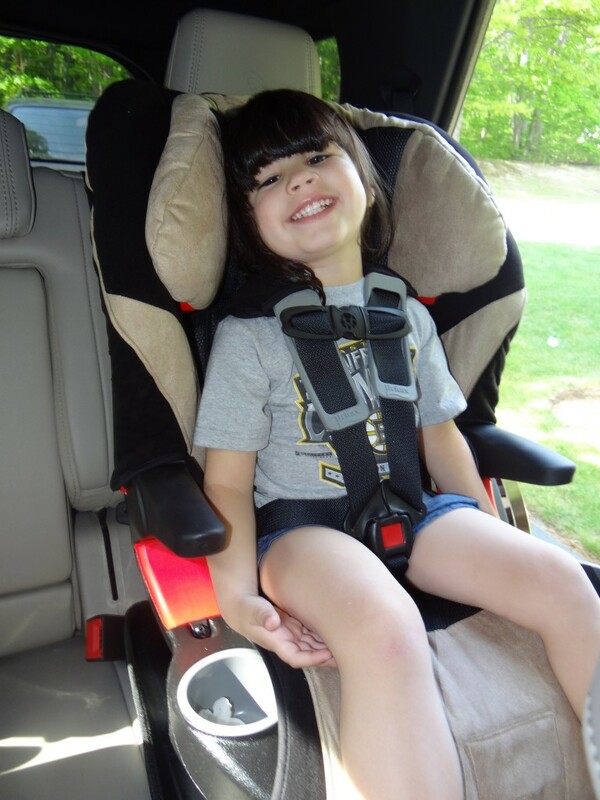 the car seats – great ratings, easy to use, safe! Have never tried any Britax products but I have heard that they’re carseats are awesome! Love Frontier XT Onyx! Durable, comfy and safe carseat. the car seats! Safety is a must! I really like their strollers! the b ready stroller is our favorite! We love our Britax Roundabout for our compact sedan and for airplane rides! We have never tried out a Britax carseat, but are in the same situtaion as you. My son is WAY too tall for a regular carseat but doesn’t weigh enough to be in a seat-belt booster seat. LOVE the looks of their Advocate 70 CS car seat! I have not used any Britax products bu I do like the carseat and strollers. LOVE Britax! We have the B Ready and its the best stroller out there! I love the B-Agile Stroller! Thanks for the great giveaway. Good luck everyone! I love their car seats most of all. I have two. I haven’t tried any of the products, but have heard rave reviews of the carseats from friend. I love the Britax double strollers! I like their strollers and carseats. Britax carseats and strollers are the best! They are so well-made and durable! I love the Boulevard 70-G3! If only they had one for those times you got stuck being the designated driver. Good way to keep them in their place. I love the Britax Boulevard and I’d also love to try the Britax B Ready stroller! I like their strollers, particularly the B-AGILE. Their care seats are my favorite. I would like the B-Nimble stroller! It would be nice to have for little one. I haven’t tried any Britax products before, but the convertible car seats look great. My favorite is the B-Agile stroller. I like the 2012 B-ready stroller. We have a britax marathon for my son, it is cozy and he falls asleep every time. It would be nice to get one for my daughter too! I love everything Britax, but my favorite product is the Boulevard car seat! We have 4 of them! ive never tried their products, but this sounds really cool! I love their car seats, safest there are! We had a Britax with our first daughter and loved it! My favorite Britax products are their car seats. They are always stylish and above standard. I don’t own one but I’ve actually heard great things about the carseats. Britax Advocate is my favorite. i’ve never bought any but i’d love the car seat-i really like the wide weight range! I love the B Nimble stroller. Love the reviews on their strollers and carseats though! Seems to be a very solid brand! B-AGILE stroller is pretty awesome! I have never been lucky enough to own one but I hear they have amazing car seats and strollers. The booster seats are awesome. We have a family of 5 children and they are all in Britax seats. Love them so much. I haven’t tried any of their products yet but would love too! I would get one of the car seats. My daughter has a Britax Boulevard and I love it. The extra safety features and quality of construction are awesome. I LOVE their strollers! I used to have the B Ready and it’s the best stroller I’ve ever used! Definitely the Marathon. 🙂 A very reliable product, IMO. We have a hand-me-down Marathon car seat and love it! Thank you. I like the 2012 B-READY! I am a huge fan of the b redy stroller and the b agile stroller… Great products! I don’t own any but I know they are great seats, just out of my price range. I am dying to get my hands on a bike seat! I have heard that they are great products but have never had the money to afford them. I would love any Britax products! I would also love the Chaperon! THe B-Agile Stoller is our fav!!! I like the strollers, especially the B-AGILE. I have a Britax car seat that I love for it’s safety features. I also like their B-Agile strollers. We don’t own any. The stroller looks awesome. Their car seats are so safe. Love them! 2012 B-READY stroller is beautiful! I really need this car seat mine are expiring. I have a 2 kids that need it. we could really use a car seat. That would help. I like their car seats. i have never had one of these products. i however am purchasing a new car next week & will be buying new car seats for my two boys 2 & 4. i have been looking around at 5 pt harness to keep my four year old in, this looks perfect! My son uses one of the britax carseats on his school bus. It fits him so much better than the one we have. I don’t have any britax products, but I have heard really good things about them. I have never tried any of Britax products b/c they are so expensive….that’s why I’m hoping to win one! When my babies were newborn and tiny I really liked having a “HEAD & BODY SUPPORT PILLOW” Worked great! I don’t have any Britax Products but a lot of my friends have the marathon. I’ve never tried a Britax product, but we are looking at getting one of their convertible carseats. Love the Britax strollers and car seats for sure! Thanks so much! Love the organic baby carriers! I have the Boulevard and I love it. The BRITAX BABY CARRIER ORGANIC is my favorite product. Most any carseat have wanted one forever for my daughter. Thanks! Their carseats are amazing! I also like the B-AGILE stroller! I don’t have a favorite yet. I haven’t tried many of them. WE have been looking into their car seats for my daughter as she has almost outgrown her infant car seat. I love their car seats. Super easy to install. We have the Britax Marathon Car seat for our son and we love it. It’s so comfortable for him and has a snug safe fit without being uncomfortable. This would be a great addition with us planning another little one next year! My cousins have the Britax B-Agile stroller and it is amazing. I like the Boulevard car seat as well. I like the britax infant carseat 🙂 this booster seat will b wobderful for my toddler. I have a pt cruiser and havn an infant seat & booster seem to take up the whole back seat. The britax booster seems a lil slimmer, I’d love to try it. I like the B Nimble stroller. I love the B-Agile stroller and the Baby Carrier Organic! I’ve never had a Britax product, but would like to. I would love the Britax B-Ready stroller! Ive never tried so I dont have a fave yet! I’d love to try the organic baby carrier. I like the Britax B Nimble! I like the stroller board and the B-ready stroller. i love the car seats. my niece has one and it is gorgeous and has lasted forever! I love their carseats. I have never been able to afford one but if I could, I’d go exclusively Britax!! The b-agile stroller is great. I have always really liked their strollers. Thank you for the lovely giveaway! I love the marathon car seat. The Frontier Booster looks awesome as well. Their carseats because of their high safety reputation! I have never had a Britax product but I hear their carseats are one of the safest on the market. I love their carseats! They’re so safe and comfy! I like the B-NIMBLE. Thanks!! I love their Britax B-safe. A friend of my mine have the Britax marathon, and I love it. I like the Baby Carrier. I like the B Ready Stroller. I like the b ready. No favorites yet but would love to make this one my first. I love their booster seats. Would love to win a brand new carseat, this carseat looks great! My son is about to transition to forward facing car seats in a little over a month and there are so many car seats to choose from. I’ve heard that Britax is a good brand though. Britax car seats are the best! I dont really know that they make anything other than car seats, but i love them!